Am 21. Februar findet ein öffentlicher Brown-Bag Lunch in der Küche des Instituts statt. HIIG Fellow Edoardo Celeste, Forscher an der Sutherland School of Law am University College Dublin, beschäftigt sich mit digitalen Konstitutionalismus und digitalen Grundrechten. Die Veranstaltung findet auf englisch statt, weitere Informationen und die Möglichkeit zur Anmeldung untenstehend. Over the last years, eminent voices from the Internet intelligentsia made an appeal for a ‘constitution’ for the digital environment. 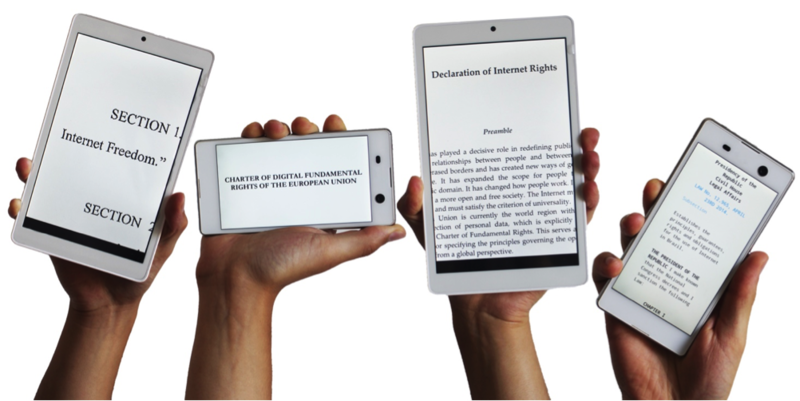 Online Magna Carta, Internet Bill of Rights, Constitution for the Internet, Charter of Digital Fundamental Rights are only some examples of the evocative denominations used to convey this idea. Moreover, as a recent working paper of the Berkman Centre for Internet and Society documented, a copious number of documents seeking to implement this project emerged. Also, these texts explicitly refer to the constitutional dimension and adopt its typical jargon, structure, and pompousness. However, beyond their solemn titles and magniloquent tone, what do these texts, and generally, the idea of an Internet bill of rights, have in common with constitutional law? HIIG Fellow Edoardo Celeste will present the findings of his doctoral research focusing on this topic. Starting with an outline of the core characteristics of the idea of Internet bill of rights, as developed by the existing scholarship, the presentation will firstly highlight those in common with the notion of constitution. Subsequently, the question of how one could justify, from a constitutional perspective, the emergence of the project to establish a similar document will be tackled. In particular, it will be considered why it would be necessary to establish a specific constitutional document for the Internet, rather than using other existing constitutional instruments, like national constitutions. Such an analysis will be followed by an examination of existing texts which have sought to implement the idea of Internet bill of rights. It will be shown that these disparate documents, in fact, encounter a series of difficulties in translating the project of Internet constitution into reality. Taking stock of the current problems, the presentation will conclude by speculating on potential future developments. Edoardo Celeste is a visiting fellow at HIIG and an Irish Research Council funded PhD candidate at the Sutherland School of Law at University College Dublin. The lunch talk is open to the public, please register in advance via brownbag@hiig.de.